Almost everyone knows about how obsessed I am with my hair. I treat my hair like my child. Pampering it with regular massages and spas, washing and deep conditioning, oiling rituals and all that you can think of. My mane also loves me back as much I love it because I put my hair though a lot day in and day out. Blow drying, straightening, twisted hair knots, hair sprays etc etc. Also, I used a million shampoos on my hair thanks to the products that come to me for review. And yet my hair has always remained my shining glory. Not once have I had a bad hair day or a messy hair day. I always make sure that my hair is prim and proper before I step out. I always have a scarf and a hair clip handy, in case of the harsh weather. I do not even take care of myself this well! My hair gets and deserves all the love and pampering I give it. But over the past few days I have been thinking about doing something crazy with my hair. I was really bored with the jet black look that I have been sporting all these years. I decided that I need to get my hair colored and try out a new look. 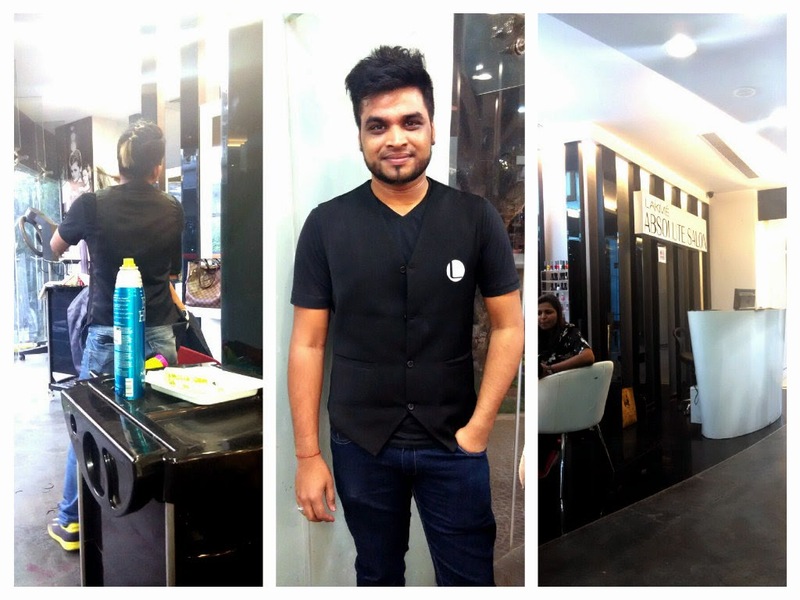 So fully determined and with the idea in mind, I walked in to the Lakme Absolute Salon located at the 1MG Road mall in Bangalore. I had an appointment booked and a stylist was waiting for me. 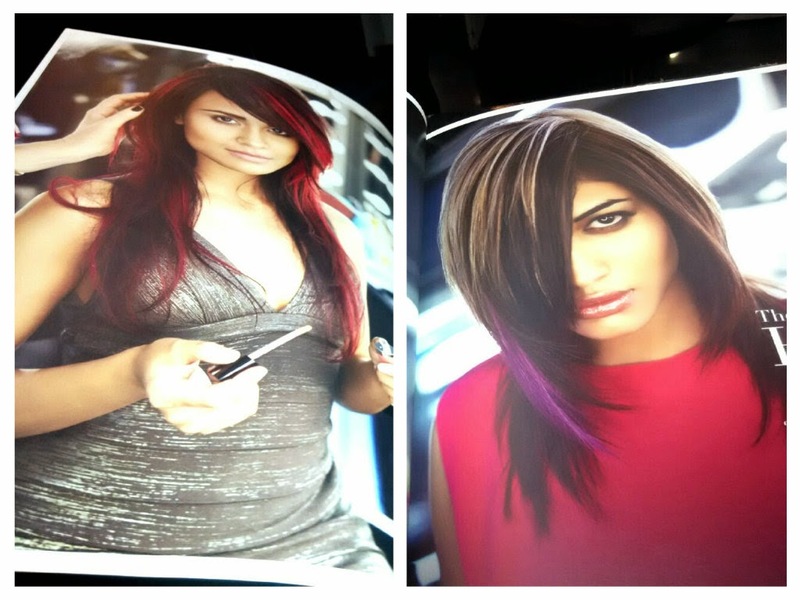 I had already gone through the show shopping hair collection from Lakme Absolute and had two looks playing in my mind. The Auburn Blend and the Helix Flair. 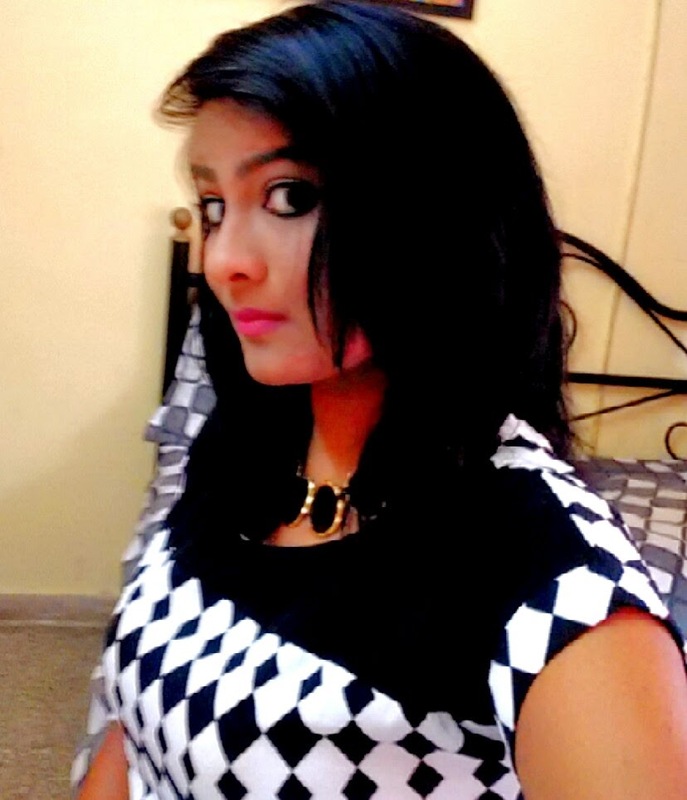 My stylist, Arun was very polite and patient and sat with me to discuss the look. As excited as I was, I could feel my enthusiasm go down as I saw the pictures of brightly colored hair in front of me. I did not want to look like a clown after all! So after much speculation and self thought I decided to go in for the Auburn Blend with just three strokes of red color. The Helix Flair had purple and that was enough to put me off. I did not want something bright, but at the same time I wanted the streaks to be seen. Also I did not want the color to be jarring. 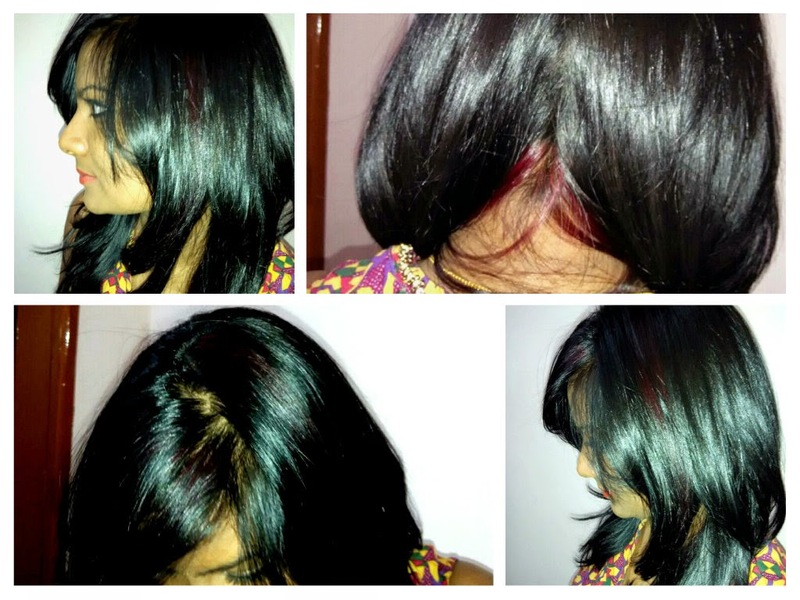 My stylist suggested that I go in for the violet-red color, that would be perfect for my dusky skin tone and look subtle at the same time. So I just decided to rely on fate and put my hair in the able hands of my stylist. He first checked the texture of my hair and said that I had really good hair. That helped me relax a bit. Nothing like a little flattery to perk me up! He then told me that since my natural hair was so black and thick, there is no need for a hair lightening agent as the color will hold good on black. So after some serious combing, we decided on the areas to be colored. The first one was a thin steak on my side fringe. The second, at the crown of my hair, so that a steak can be split into two with a partition. And the third, right at my nape, so that it will stay hidden and be a pleasant surprise when I tie up my hair. I liked the idea and asked him to go ahead with it. He went to the studio to mix the color, while I sat with a magazine sipping on to some hot green tea. He was back really soon and with extreme precision and care he divided my hair into sections. He then placed the aluminium foil beneath the section and began applying the color. The color looked so bright in the bowl that I cringed. My stylist sensed my fear and assured me that the color would not look so bright once washed. I was only relieved to a certain extent. After applying three patches of color he asked me to wait for thirty to forty minutes for the color to hold. I read more magazines, made small talk with the people around and had some more tea. Finally it was time for the wash and to see the actual color. Arun washed my hair and conditioned it and even gave me a head massage. I was in heaven. He asked me if I needed a hair cut, and I said that a trim would be fine. After a trim, my hair was blow dried. And that is when I saw the color! Red! Red! It was red! A part of my hair was red! And it looked absolutely amazing. The cut went well with my round face and the color complemented my skin tone and my black hair really well. I felt so happy that I couldn't stop thanking my stylist. The color was not too bright, and yet a hint of it could be seen. Arun told me that after a few days the color would be seen more clearly. I was really really satisfied with the awesome treatment my hair received there. After thanking almost everyone there I came back home a happy lady. The color bleeds for a few washes. It has been a week and still I see faint traces of color in the lather of my shampoo. The color looks much brighter and better though and I'm very happy with my new look. My stylist said that the color would easily last for atleast twenty washes. Its a good deal I think. I am absolutely in love with my new look and cannot wait to flaunt it off with different styles. My experience at the salon. 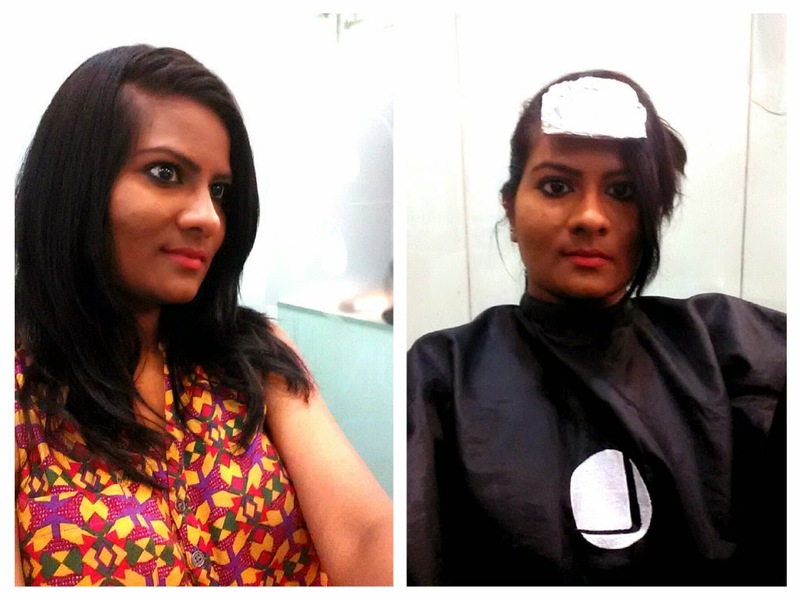 Thank you Lakme Absolute for a wonderful experience and making my hair look and feel so awesome! I had some highlights put in my hair some years ago when I visited India. Looked pretty glamorous. But not sure if I'll have the courage to try it again. The streaks were not so visible on the first day. It got brighter later on. How beautiful and natural looking and even better you don't have to damage your own hair. I recently did some burgundy hair extensions in my blonde and loved the new yet temporary look.